I started an eMusic subscription when I lived in the States. My subscription still works fine from Singapore, but before I log in I get the weird message at right. I get similar stuff on YouTube and other video sites a lot -- videos sometimes won't play if the user IP address is in Singapore. Tech-savvy friends of mine have established IP proxy accounts in the USA to deal with this sort of thing. 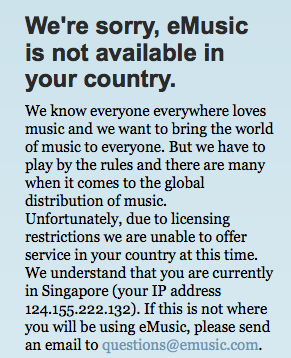 I don't have a good sense for why this is happening -- do they think Singapore is a den of piracy or something? It's really not. The rest of Southeast Asia can be all yo ho ho and a bottle of rum, but as with many other things Singapore is a place where laws are obeyed at least as well as in the USA. eMusic, by the way, is a pretty good deal, though it seems that the way the plans are structured are constantly changing. Before I was getting an excellent bargain on a narrow selection of (non-DRM) music, but then prices went up while the size of the collection increased. Now I'm getting a pretty good deal on a wider selection -- 9.99 per month buys me about an album and a half. I liked the earlier deal a bit better, since they were pretty good on obscure Irish and Scottish folk songs that I like. I don't know whether I'll renew at the end of the year, but at worst it's been a pretty good deal while it lasted. The music publishers simply make different deals in different countries. It's much easier to be a pirate. Rrrrrrr! You should absolutely do a post about obscure Scottish and Irish folk music, I need some new recommendations! I've been following a related area, the development of online distribution of anime and manga, and legit online distribution of anime is plagued by the same problems. And to add insult to injury, the one new series that the Rest of Europe and Rest of Asia get is the only one getting universally bad reviews (1/5 to 2/5) from the anime previewers at Anime News Network. Its hard to see this as anything but the "past bound" nature of economic institutions that the American Institutionalists tell us of. After all, the alternative is not that the people in the countries without access have to wait: the alternative is that they view the series with subtitles either ripped from legit streaming sites or created by bootleg subtitling groups via leech streaming sites or via torrent download. Maybe it is because they are ad driven, and advertisers don't want to pay to show ads to people in poorer countries? I think some free email services do the same thing. Maybe, Max, but then they're really screwing up with Singapore, which is basically Japan (on a GDP per capita basis).